In an emissions trading scheme, the generic term for the unit of trade is an 'emissions permit'. These fall into two broad categories. Emission 'allowances' are normally allocated to sources and must cover all of the emissions from the source, while emissions 'credits' are generated when a source reduces emissions below an agreed emissions baseline. Allowance schemes allow all emissions to be traded, while credit schemes only allow emission reductions to be traded. In an allowance scheme, the emissions cap refers to the aggregate emissions limit applied to a group of polluters for a given period of time. These schemes are commonly referred to as 'cap and trade' schemes. When applied to GHGs, allowances are normally denominated in tonnes of CO2 equivalent (tCO2-eq). The overall cap is then set by the total number of allowances allocated within a given period. Historically, most cap and trade schemes have allocated allowances for free, typically on the basis of historical emissions. A preferred approach is to put a fixed quantity of allowances up for sale in an auction. The revenues from the auction may be recycled to participants and others in a variety of ways to ensure that the overall scheme is revenue-neutral. This means there is no increase in the aggregate tax burden, although there will necessarily be winners and losers from the scheme. A combination of free allocations and auctions is also possible. Allowance banking refers to retaining surplus allowances for use in subsequent compliance periods, while allowance borrowing refers to using allowances from subsequent compliance periods to cover current emissions. While many trading schemes use allowance banking, borrowing is rare due to concerns about non-compliance. The EU ETS is an EU-wide cap and trade scheme for carbon emissions, in which the participants are large industrial installations. Several other developed countries are now introducing comparable cap and trade schemes at either the national or regional level. The Kyoto Protocol effectively introduced an international cap and trade scheme for developed countries, since individual countries have agreed upon absolute targets for GHG emissions and are allowed to trade with each other under the system of International Emissions Trading (IET). The Protocol also introduced two credit based trading schemes: Joint Implementation (JI), which applies to emission reduction projects in developed countries, and the Clean Development Mechanism (CDM), which applies to emission reduction projects in developing countries. Taken together, these three instruments are termed the 'Kyoto mechanisms'. (iii) efficient allocation, in terms of minimising the overall cost of carbon abatement (achieved through allowance trading) (Daly, 1996). (i) Wide or narrow? Broader and deeper trading schemes involving actors from widely different parts of the economy should provide a stable and liquid market with greater scope for cost saving. However, differentiation between sectors may be justified on distributional or other grounds. For example, current UK policy excludes household fuel use from carbon pricing in order to protect low-income groups from high energy prices. Similarly, including road transport in a wider trading scheme could be problematic, since the high abatement costs in this sector may push up carbon prices with adverse effects on industrial competitiveness and income distribution. (ii) Flexible or predictable? To encourage firms to invest in low carbon technologies, the carbon price needs to be long term, credible and predictable. If the profitability of an investment hinges upon the future price of carbon, investors are vulnerable to both future changes in government policy and the outcome of international negotiations. Allowing investors to bear this risk is economically inefficient, since it increases the required rate of return on projects and discourages investment and innovation in low carbon technologies. While carbon trading inevitably leads to some uncertainty over future carbon prices, this can be reduced if carbon targets are predictable over the long term. But at the same time, policymakers need the flexibility to adjust carbon targets in response to new scientific and economic information and new political developments. (iii) Open or closed? The ability to trade allowances with other sectoral, regional, national or international schemes should offer scope for further cost saving, help prevent the abuse of market power, improve liquidity and reduce allowance price volatility. In addition, links to the CDM may allow investment finance to be channelled to environmentally beneficial projects in developing countries, thereby encouraging technology transfer and sustainable development. However, such links may also reduce the domestic carbon price and hence further reduce the incentive for developing or adopting low carbon technologies at home. There may also be concern about the stringency of the caps in the linked schemes and the implications of particular design features such as price caps or weak non-compliance procedures. 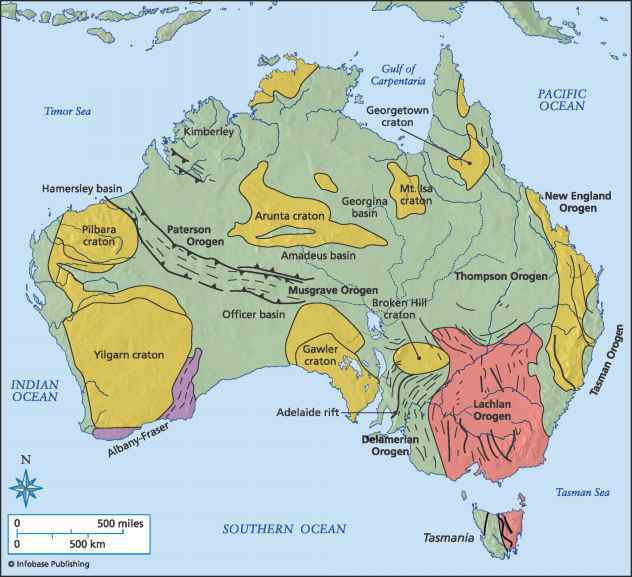 If the linked scheme is a project-based mechanism such as the CDM, there may also be concern over whether the emission reductions are really 'additional' to what would have happened in the absence of the project (Ellis et al., 2007). Some of these concerns are reflected in the Kyoto Protocol requirement that international trading be 'supplemental' to domestic action, but this requirement has yet to be operationalised in an effective manner. deeper emission cuts in the long term, as well as reinforcing the political opposition to such reductions (Figure 11.1). In contrast, trading schemes that are relatively 'narrow' and 'closed' will increase abatement costs in the short term by restricting the ability to trade and could also lead to emissions 'leakage'. But if these restrictions are combined with greater predictability over long-term carbon prices and more ambitious caps, the incentives for structural change, innovation and investment in low carbon technologies will be increased. The drawback is that the consequent increase in short-term abatement costs could make it correspondingly more difficult to agree to ambitious targets for emission reduction in the short to medium term. The success of any particular trading scheme will therefore partly depend upon how these tensions are resolved. Much of the current debate over the future of emissions trading revolves around different approaches to reconciling these objectives. A key question is whether they can be resolved through the design of the trading scheme(s) themselves, or whether supplementary measures are required. 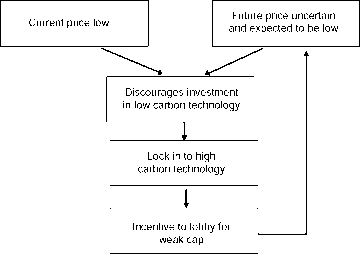 For example, Helm and Hepburn (2005) propose that the UK government provides long-term price certainty to investors by auctioning off 'carbon contracts' for the supply of emission reductions at a fixed price over a long time horizon. This is very similar to existing project-based mechanisms such JI and the CDM, only with a guaranteed carbon price backed by the government. Assuming that the appropriate mechanisms are in place, the government could subsequently recover some or all of its costs by selling the resulting credits into an emissions trading scheme. It seems likely that trading schemes will need to be supplemented by measures such as these, including targeted support for low carbon technologies.